On the corner of the 2nd Hoofdstraat and the Keizergracht the Goldsteen family had a chemist’s and paint shop. Hartog, Rezina and their two children lived in a house behind the shop; situated on the Keizersgracht. Apart from selling paint they sold herbs, medicine, everything that a chemist would sell. Also liquorice; children accompanied their mother and enjoyed coming to the shop, because after shopping they would often get liquorice. Hartog Goldsteen was a painter, just like the rest of the family, so he was always about painting houses inside and out. His wife ran the shop. A small group of Meppel people during an excursion to Oranjewoud (a recreation area in Friesland) in 1932. Back row from left to right: Levie van de Rhoer, Bilha van de Rhoer-Goldsteen, Hartog Goldsteen, Rezina Goldsteen-Turksma, Anna Roos van der Sluis, Salomon Roos, Betje Brest-Polak, Alexander Brest, ? de Vries. Second row from the back from left to right: Hannie Kroon, Jetje Schaap, Frits Goldsteen, ?, ?, Max Cohen, Lini Goldsteen, Jacob Zaligman, Dina Zwarts, Eli van Gelder. Third row from the back from left to right: Sonja van de Rhoer, Rozetta van Gelder, Nanny van de Sluis, Hans Blein, ?, Meta Brest, Vrougje Zwarts, Eddy Roos. Front row from left to right: Anna van Gelder, ?, Rose Brest, ?, Ali Wolf en Lia Roos. The 3 persons on the right do not belong to the group. Hartog Goldsteen was born at Ruinen on the 19th of September 1887. His father was not known so he was named after his mother. Leentje, Hartog Goldsteen’s mother lived until her death on the Brink (village centre) in Ruinen. In her old age she was known as ‘olde Leene’. Every Saturday Hartog would come from Meppel on his motor bike with sidecar to visit his mother. In those days this type of vehicle was a rarity. Reason enough for the village youths to be very interested in the visits of Hartog to his mother. ‘Olde Leene’ was just like her son arrested and killed in October 1942.The morning after Leentje’s arrest, the neighbours closed the shutters of the windows, as if they anticipated that the she would not be coming back. When her house was searched they found on her mantelpiece a ‘Buisman’ tin (a coffee substitute) with half cents. For her upkeep Leentje would knit stockings and the proceeds she would put into the tin. 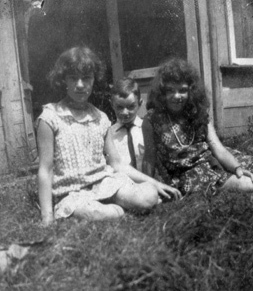 Lini Goldsteen (right) with Nanny van der Sluis and Betje Roos on Zuideindigerpad. Hartog married in Deventer on the 30th of April 1919 Rezina  Serina Izak Turksma (born in Drachten on the 29th of December 1890). Rezina was one of nine children of Izak Moses Turksma and Froukje van Leer, all born in Drachten. 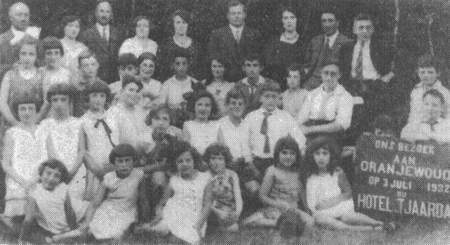 The other eight children were: Mozes Izak, Reina Izak, Salomon Izak, Clara, Alida, Leman Izak, Clara Machla Izak and Jacob Izak. Of all the children only two survived the War: Leman and Jacob. After the war the latter became trustee for the possessions of Hartog and Rezina. 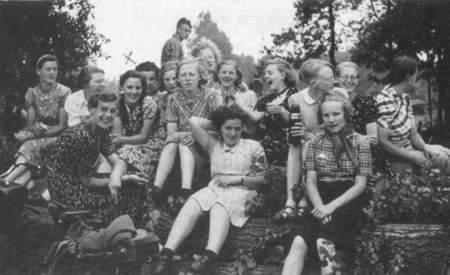 Frits Goldsteen (far back) en Hannie Kroon (in front with white dress and black hair) during a school trip of ULO (secondary school) in 1939. Hartog and Rezina had two children: daughter Lini was born on the 14th of March 1920 and son Frits was born on the 17th of December 1922. After primary school Frits went to the Openbare MULO (State College) and Lini went to Huishoudschool (School for domestic science). 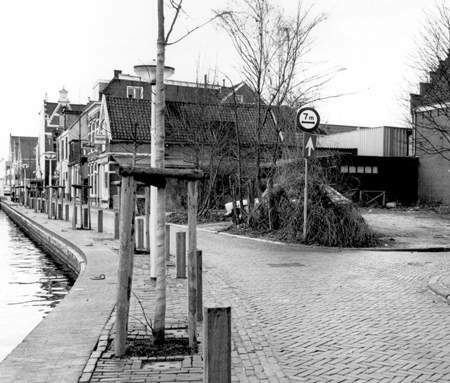 Lini lived in Meppel until the 20th of April 1942; then they moved to the Surinamestraat in The Hague (Den Haag). The reason is unknown. Likewise Hartog and Frits left the house, but that was for a completely different reason. First Hartog had to report himself at Het Vledder (Meppel) on 20 July 1942 and from there he went by bus to the labour camp in Orvelte. Soon after, Frits left with 25 other young men from Meppel via camp Linde to Westerbork. Both have, except for a possible day of leave, never been back in Meppel. Frits, was transported from Westerbork to Auschwitz on the 7th of September and was gassed on the 10th of September. Why Frits was killed in Auschwitz so much earlier than the other young men from Meppel, who were also taken to Linde with him, is unknown. 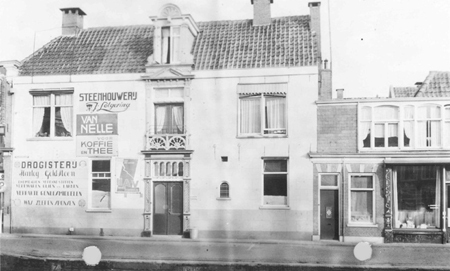 When the Meppel Police took the Jews out of their houses in the night of 2nd to 3rd of October, Mrs Goldsteen was alone at her home behind the chemist’s. The Police seemed confused, because they were banging on the door of the Lotgering family who lived above the chemist’s. They said, ‘come with us’ and on the question ‘why’ they said, ‘You are Mrs Goldsteen, aren’t you?’ When Mrs Lotgering denied they passed on. A little later they were banging on the ‘right’ door and they took Mrs Goldsteen. Hartog and his wife Rezina saw each other again at Westerbork on the 3rd of October, but it remains unknown if they ever saw their daughter again. The couple stayed only two days in the camp. On the 5th of October they were deported to Auschwitz, where they were killed on the 8th of October. Daughter Lini was probably not at the camp yet, because she was gassed in Sobibor on the 16th of July 1943. Maybe she arrived at a later moment. On the 16th of March 1943 Omnia liquidated the business of the Goldsteen family. The chemist’s and paint shop had been closed for a long time (doing business had been made impossible for Goldsteen). Only Lini was alive at that moment. Recently it appeared that Hartog Goldsteen had hired a safe at one of the banks in Meppel. In 1942 the safe was broken into by order of the Germans, and its contents  securities, jewellery and other valuable objects  were taken out and disappeared!